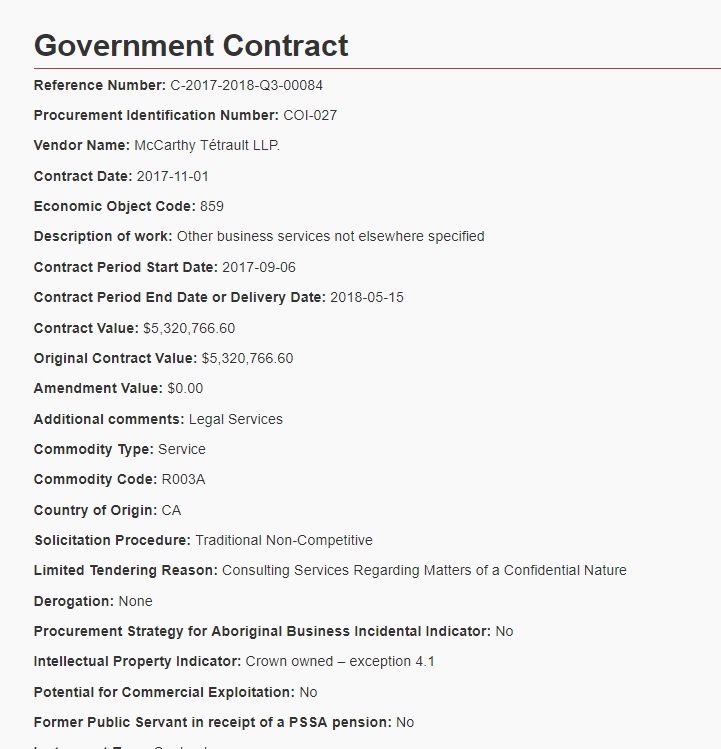 It’s a staggering amount for a contract that only lasts 8 months, the law firm McCarthy Tetrault is being paid $5,320,766.60 in a sole sourced contract. A contract worth almost 10% of the inquiry’s $54 million budget. What is the work for? Well at this point, that is unknown. Despite phone calls and multiple emails, my three simple questions to the inquiry have gone unanswered. Given all the coverage of problems at the inquiry, a contract like this should raise questions and those questions should be answered. Is that sufficient for a contract so large? Consider that $5.3 million fee is for a contract that lasts just 251 days. That works out to $21,198.27 for each day of the contract. If we assumed a 10 hour work day that would mean McCarthy’s is billing out at $2,119 per hour. I doubt the folks at McCarthy’s are working 10 hours a day, 7 days a week. We don’t even know how many people are working on this contract. We have no clue what this money for. 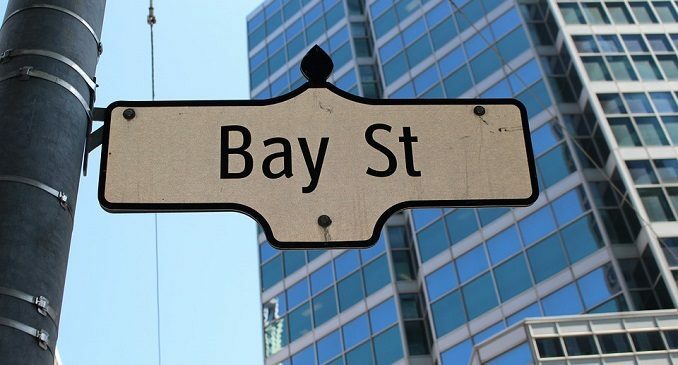 We have no clue why a single Bay Street law firm is getting 10% of the inquiry’s budget and without any of that knowledge, no one can determine how or if this large payment is doing anything to help the families the inquiry is supposed to be there for. The questions I sent to the media and communications team were quite simple and straightforward, yet after giving them 9 days to respond, nothing. Here are those questions. 1. This contract appears to be sole sourced, is that accurate and if so, why was it sole sourced? 2. What kind of legal services are required by the inquiry that could not be conducted by the thousands of lawyers on staff at Justice? 3. What is being done for this $5 million over eight months? Now, there is nothing illegal about an inquiry like this giving out a contract on a sole sourced basis, that is a power they have under the inquiry act but if we are paying the money, we should know why it was sole sourced. There is also the question as to why the hundreds upon hundreds of government lawyers already on staff could not have been assigned to do this work. The Justice Department literally employs hundreds of lawyers and assigns them to work with government departments, agencies, etc. Over the course of the inquiry there have been a multitude of stories showcasing mismanagement, resulting in many high profile resignations and complaints from family members about a lack of respect including the high cost of them participating, often travelling long distances to appear at hearings. I’m sure the folks at McCarthy’s aren’t wanting for travel funding. For too long the families at the centre of this inquiry have had to push for answers on their loved ones, they shouldn’t need to push for answers on this as well. Didn’t the RCMP do an exhaustive inquiry a few years ago and determined in about 99.9% of the cases a family member, spouse, relative or another Indian was responsible for the crime? In any event, I’m sure the Liberals have already come to the conclusion, “whitey” and “white privilege”, or “old stock Canadians” are to blame. Massive pay outs and apologies to follow. This enquiry is totally unecessary as you mention, but you are missing the point. The purpose of these enquiries is simply to stuff your money nto their Liberal pockets. Yep they did!! Getting awful sick of the Indigenous bleeding my bank account dry, aren’t you?? It is all BS!! They are taking OUR money and giving it to their friends. That’s what Liberals do… Every day. At every opportunity. You can only spend other people’s money until they go broke – then you look like Venezuela. At this rate it might actually happen. What do you wanna bet that law firm consists of some heavy contributors to the Liberal party of Canada and Ontario. Unbelievable! over $5 million would put a lot of buses on the Highway of tears or provide supports for families, which are virtually nil. We need to bring accountability to the inquiry, write your MP now! An extension of 2 years will only make this even more unbelievable, and a waste of time and resources. Let’s get on with action now! We have spent many months writing, emailing MP’s but it seems they are afraid of the Chiefs’, band councils, Bellegarde & his sheeple. We have no leadership in Canada anymore or there would be accountability, transparency and truth.